Each year the National Audubon Society sponsors the Christmas Bird Count (CBC), an international event that occurs during the last two weeks in December and the first week in January. In turn, New Hope Audubon sponsors the Jordan Lake Christmas Bird Count within a 15-mile diameter circle centered on the lake. As compiler for the count, I have been monitoring the ebbs and flows of the data as certain bird species have increased in numbers while others have decreased. One species, the Ring-billed Gull, has increased explosively in the past decade. When the South Wake County Landfill opened in 2008, there was a sudden increase in available food for these consummate scavengers. In winter, when the gulls migrate south, tens of thousands of them have settled in at the landfill each day, enjoying picking through the detritus of our human-generated waste. Each night, they fly west to roost on Jordan Lake in safety from terrestrial predators. For a short history of this phenomenon and the potential impact on Jordan Lake, you can read a blog article called Gull Poop that I wrote for the New Hope Audubon website in December 2017. And click here for an in-depth scientific article by R. S. Winton and M. River (2017). 1. In the decade since the landfill opened (February 2008) that roost has ranged from 28,000 to 65,000 gulls, with an average of 41,000. During those years, there were no other significant concentrations of gulls in other parts of the lake or at nearby Harris Lake. 2. The total number of Ring-billed Gulls reported on this year’s Christmas Bird Count (CBC) on December 30, 2018, was approximately 10,000. In contrast to previous years, only about 2,000 gulls were present at the evening roost on the lake near Ebenezer Point. 3. The total of 10,000 gulls this year were dispersed to various areas as follows: about 2,000 near Ebenezer Point, about 5,000 from Farrington south to White Oak Creek, and about 3,000 on Harris Lake. Brian Bockhahn, compiler of the Falls Lake CBC, reports that there were about 4,000 gulls on Falls Lake on January 4th. 4. Roy Baldwin, the Solid Waste Facilities Manager for Wake County responded to my inquiry about the number of gulls at the South Wake Landfill as follows: “We have just as many [gulls] as ever on our working face. With the exception of using less posi-shell, none of our operations have changed.” Posi-shell, according to the LSC Environmental Systems website, is a “blend of clay binders, reinforcing fibers, and polymers that, when mixed with water or leachate, produces a spray-applied mortar that dries in the form of a thin durable stucco.” So, if the landfill is using LESS Posi-shell, it seems that would make food MORE available to the gulls. Mr. Baldwin did not give me an estimate of the number of gulls at the landfill. 5. On December 30, Jordan Lake was at 230 feet. That’s 14 feet above its normal elevation of 216 feet. When we did this same count on January 3, 2016, the lake level was 232 feet, or 16 feet above normal. That year, we estimated the Ebenezer roost at 30,000 gulls. Except for about 1,000 gulls near Farrington, there were no other significant concentrations elsewhere on the lake or at Harris Lake. 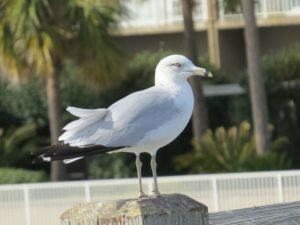 •	An observer reported, “I noticed in November a decline in gull numbers on Falls Lake [as seen from] from Rolling View. — See bullet #3 above, only 4,000 gulls seen on January 4th. •	Someone suggested that perhaps there were changes in practices at the landfill. –See bullet #4 above, Roy Baldwin’s comments. •	We just set the record for the highest rainfall total for a year in our area, and much of it occurred in the fall. Jordan Lake has been held at 14 feet or more above normal to prevent downstream flooding. –As far as we know, the gulls do not feed on the lake. They seem to use it only as a roosting site. •	An observer reported that many gulls were seen flying from the landfill toward Lake Crabtree near the Raleigh-Durham Airport. •	One person asked if there were any actions being taken to drive the gulls away from the lake—for example cannons or guns. — See bullet #4 above, Roy Baldwin’s comments. If the lake level returns to normal next year, or even later this year before the gulls head north to breed, we might get more insight into possible explanations. But for now, we have questions, but no definitive answers.